Oops, there the European Union drains another 2300 chemistry jobs as Pfizer announces job cuts in Sandwich UK. Too bad because this blog just came across some recent&decent research by Ashcroft et al. (DOI) originating from just this facility. The topic is eletriptan and novel way to synthesise it. The compound commercially known as Relpax and supposed to treat migraine is horribly expensive. A quick internet search gives a ballpark value of 15 US dollars for a single 20 mg tablet and finding an alternative synthetic approach therefore makes a lot of sense. Synthesis of chunk 1 started off from the dimethyl acetal of bromo acetaldehyde 1 which was converted to dioxane 2. 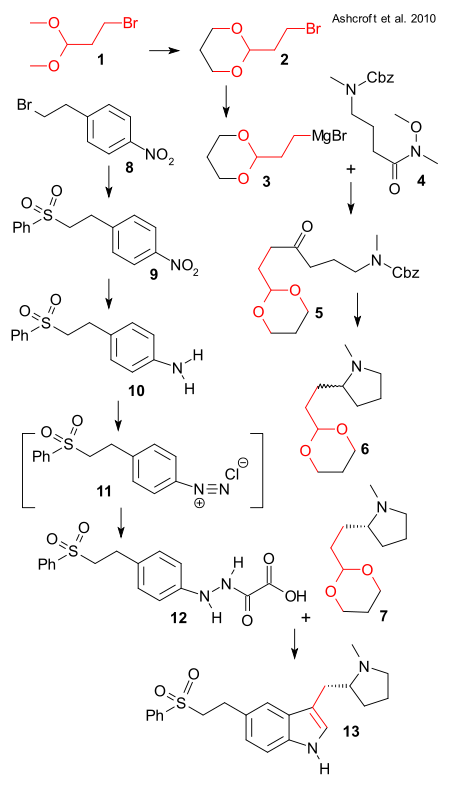 After conversion to Grignard reagent 3 it was reacted with Weinreb amide 4 (derived from 4-methylaminobutyric acid and carboxybenzyl protected) to ketone 5 (THF, 60°C). Deprotection , cyclization and imine reduction (H2, Pd/C MeOH) then yielded racemic pyrrolidine 6 isolated as its fumarate salt. Although asymmetric synthesis has been around for 40 years, industry still relies on good old chiral resolution: chiral (R)-7 was isolated from the diastereomeric salt with the dibenzoyl ester of tartaric acid. The authors also add this route was not their favorite for other reasons: the intermediates are all clumsy oils and functional group protection is something you want to avoid. Chunk 2 was prepared from 4-nitrophenethyl bromide 8 . Reaction with sodium benzenesulfinate (2-propanol/water) gave sulfone 9 and without workup hydrogenation (Pd/C) produced aniline 10. Oxidation with sodium nitrite gave the diazonium salt 11 which was isolated as the oxalyl hydrazine 12 by reaction with ascorbic acid. In the final step the free hydrazine was liberated from its calcium salt by adding sulfuric acid and joined with 7 in a Fischer indole synthesis to target eletriptan 13.